Winter is here, and we are currently in a deep freeze in the North East. 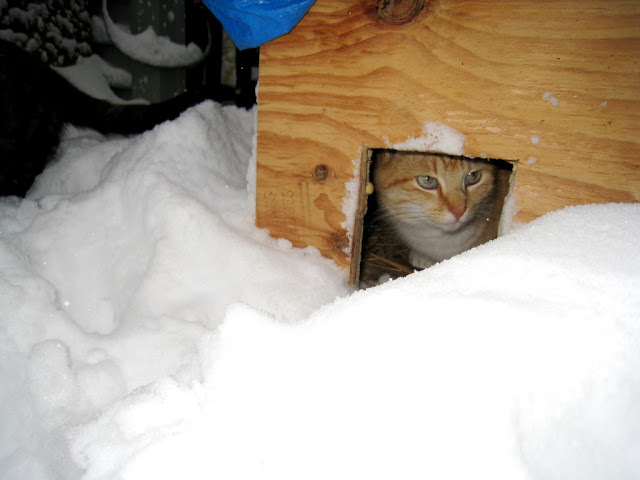 I worry so much about the community cats in bad weather, and I’m sure many of our readers do as well. According to The Humane Society of the United States, there are an estimated 30 to 40 million stray and feral cats in North America. Strays are lost or abandoned cats, who were pets at one point in their lives, and are used to human contact. Ferals (also referred to Community Cats) on the other hand, were born outside and are not accustomed to (and often afraid of) human contact. 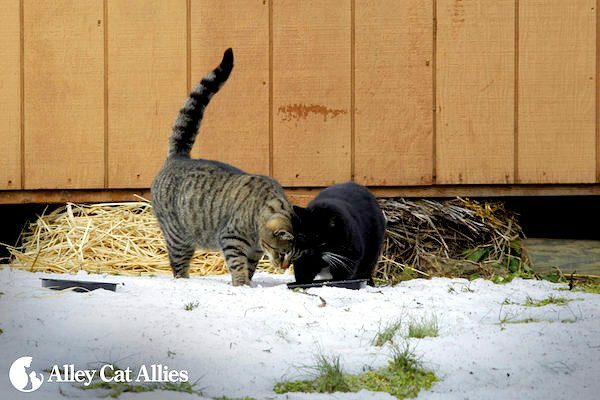 Becky Robinson, president and founder of Alley Cat Allies, tells us that community cats are fine living outdoors, and cannot be adopted as pets. Many people think feral cats would be better off the streets and in a shelter, but it’s a sad reality that community cats’ odds of making it in a traditional shelter setter are grim and they often face euthanasia. Although people may mean well by taking a feral cat indoors in the winter, it’s not a good idea because they most likely will not be able to adjust. It’s best to leave the cats in their familiar colony and environment. There are a few steps that can be taken to make the winter just a little less harsh for them and to give you peace of mind as well. Even though cats grow a thicker coat in the winter, they still need a refuge where they can escape the cold, wind, snow and rain. A good shelter can make a world of difference in their lives. A shelter doesn’t have to be fancy, and a simple shelter is actually easy and inexpensive to make. (I made some a few years ago with my friend, and if I can do it, anyone can!) Here’s a video from Cole and Marmalade that shows just how easy it is. While some cats like to huddle together for warmth, there are some who won’t go in a shelter with other cats. Consider making multiple shelters to make sure there are enough warm spots for everyone. 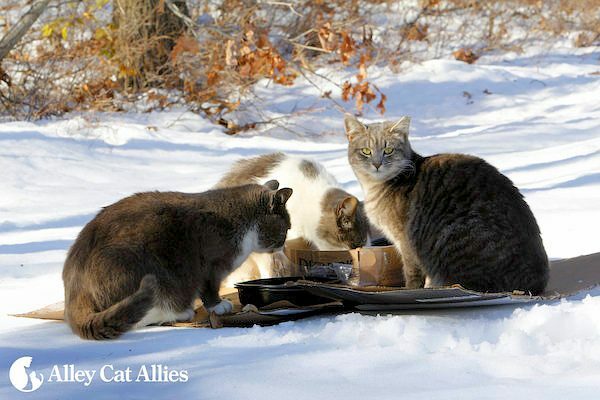 Having sufficient food and water is vital to community cats’ survival, which can be somewhat challenging in the winter. 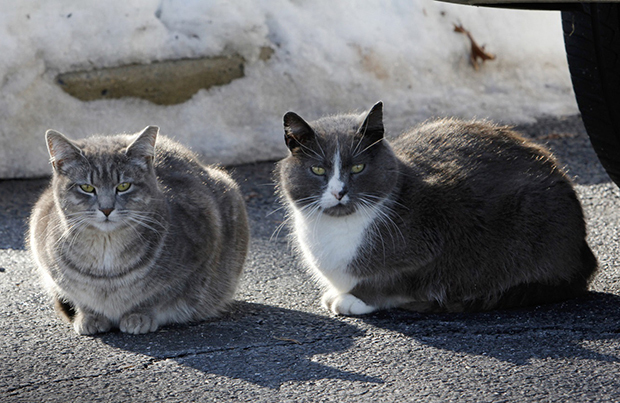 Community cats require more calories in the winter to help them stay warm. You can slightly warm some food and put it out at the same time every day so the cats will learn to arrive then and eat the food before it freezes. (Wet food is ideal for feral cats in the winter because it takes less energy to digest than dry food, and the cats can use the extra energy to stay warm.) Since dry food doesn’t freeze, add some kitten dry food to provide some extra calories. For water, use water bowls that are deep rather than wide, and try to place them in a sunny spot. Using silicone camping bowls or baking pans make emptying frozen water easier since the ice will pop right out. Consider using bowls that are darker in color, made of thick plastic and have a small opening. Heated electric bowls or solar heated bowls will really help prevent the water from freezing. To prevent dehydration, check their bowls twice daily to ensure the water hasn’t frozen. Just remember not to put the water bowl in their shelter. You don’t want it to spill and get the hay wet which will result in the cats sleeping on ice. It’s ideal for feeding and water stations to be protected from the cold and placed as near to the sleeping shelter as possible. The cats will be less exposed to harsh conditions when they need to eat or drink. Outdoor cats will seek warmth in areas that can sometimes be dangerous. This includes curling up in a car engine or sleeping in the wheel wells. Before you start your car, give it a good tap on the hood and honk your horn, and check underneath as well. Many products people use in the winter can be deadly to cats. Cats are attracted to anti-freeze, so make sure it is stored in a secure place. If you see any spills, clean them up right away. Another product that is dangerous is salt (and other chemicals) used for deicing. Not only are they toxic, but they're also harmful to their sensitive paw pads. Pet safe alternatives are available at pet and hardware stores. There are many resources available that you can refer you. Just a few are below. Best Friends Animal Society has information on caring for stray cats in winter and how to help stray cats in winter. Alley Cat Allies has information on winter weather tips for strays and feral cat shelter options. Neighborhood Cats has information on keeping cool cats warm. Feral Cat Caretaking has loads of information on caring for community cats. The ASPCA has a feral and community cat guide that provides webinars, TNR info, cat colony management tips, and more. You can help a community cat survive the winter more comfortably All it takes is a little extra attention and care. Are there community cat colonies in your neighborhood? We are so thankful that so many try to help, those sweeties need all the help they can get. Great article, Dawn. This is such important information for how we can all help keep our outside kitty pals safe when the weather turns colder. Thank you! The Hubby and I were just discussing if we want to change The 'O' Cats feeding station during the upcoming frigid week. I may leave things the way they are, but put cardboard down so their paws are not on the cold ground. Good post! 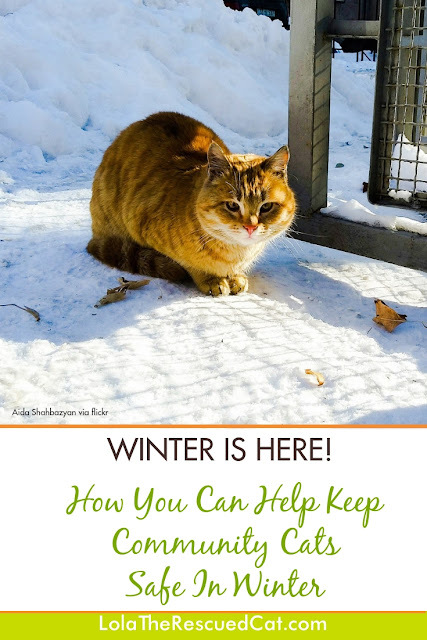 Thank you for posting some really great information for helping kitties who may be out in the cold during the winter. Hope this helps these little furbabies stay safe during the cold months. Thanks for sharing. Have wonderful weekend. Such an important post! With the horrid cold we've been having it makes me feel sick thinking about animals outside. It’s amazing that there are so many strays out there. And that with the help of good people, somehow survive. Thanks for sharing this important information. 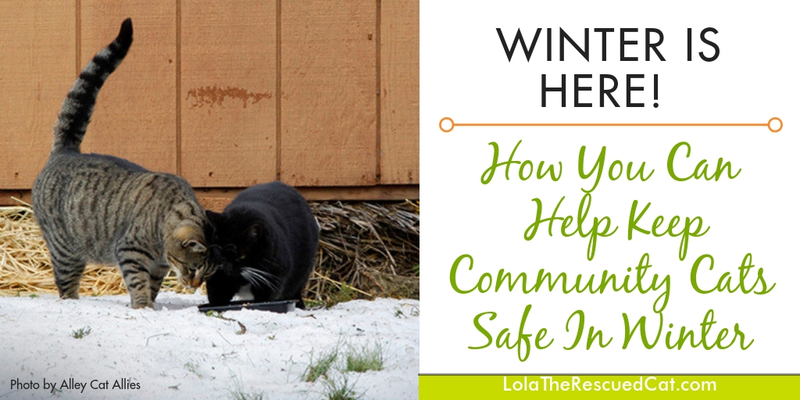 It's so important that feral and community cats get that extra bit of help in the winter - especially in areas where the temperatures dip below freezing. You have such great info here. I am so glad of the information here. I wish that it was a standard thing posted on vet offices! Great information! I worry about cats when it rains here in Southern California. I can't even imagine what it's like for them in colder parts of the country.